Posted on April 07, 2015 in Columns, Slideshow, What's APP-ening? With the ever-changing technological world expanding by the second, Apple has found a way to keep up with the competition by introducing the Apple Watch. The Apple Watch is a sleek, modern-faced gadget that was announced by the company on Sept. 14 of last year, to be made available on April 24. Some people may believe the company has gone too far this time, taking one of the classic methods of time telling and modernizing it to the point where it’s a fashion statement instead of a tool — but I disagree. 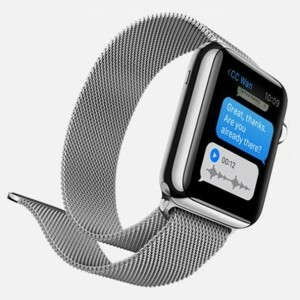 The Apple Watch is what every person should be rocking on their wrist this fall. What makes the watch unique from your typical watch is that someone is able to personalize the watch to the exact details they would prefer on a watch. There’s different bands, different clock faces, a choice between digital and analog settings, ways to keep relevant information such as the weather, alarms, etc. on the clock’s face, not to mention accurate timekeeping. That’s only a few of the Apple Watch’s main features. The watch is synced up with your contacts and calendar in your iPhone and if this a setting you’d prefer, gently pulses on your wrist when receiving a notification. Some may argue that a smartwatch is just another way for society to tune out of reality, and while this may be true, it also has the potential to help an individual focus on his or her own personal agendas. The watch features a way to keep track of all the ways you move, whether it’s actual exercise, walking up the stairs, or briskly running to class and is able to keep track of your calories burned while doing these simple activities. The exercise feature of the watch has three rings on it: one for moving, one for exercise, and one for standing still. Your goal? To complete all three rings each day. For the competitive person, this is great. For the not so motivated person, this is initiative. Like any other Apple product, the watch is not necessarily the cheapest. According to the Apple website, the basic sport version of the watch would cost someone about $349. The Edition Model, however, adorned with gold casing and sapphire crystal options is priced starting at $10,000 — but who’s really going to pay that type of money for anything other than a car, a place to live, and maybe a semester towards a Bachelor’s degree? Let’s put some things into perspective. Certain people are willing to spend about a few hundred dollars on a high quality, stainless steel, waterproof watch that will last them quite a few years. With the Apple Watch, a person is not only getting a timekeeping tool (which is the whole point of a watch), they’re also getting personalization options, app options on the wrist, GPS and WiFi options, and fun settings that all Apple products provide with every new product released. According to Yahoo! Tech, the Apple Watch is priced lower than the original Apple iPod. You’re getting more for your buck and who doesn’t like the sound of that? With all the enticing and useful options the watch offers, it’s hard not to think about possibly treating yourself to one down the line when the cash flow is a little more abundant. It’s time to leave those one-dimensional, overplayed watches in the past. The Apple Watch is here.